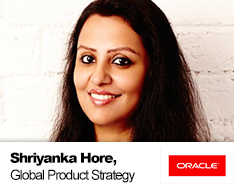 Shriyanka leads the Global Product Strategy for Payments at Oracle’s Financial Services Business. Shriyanka is an industry leader in payments and transaction banking and works closely with banks across the world to shape their digital roadmap while steering Oracle’s vision and offerings in payments technology. She has worked in global roles in the past architecting large enterprise deals and engineering contemporary payments solutions over a 15 year long career . She works closely with regulators and is an active contributor and advisory panel to key fintech publications. She is also a certified blockchain and AI architect with a curious appetite for emerging tech .